Journey to a hidden woodland destination somewhere in London for a unique culinary immersion. Greeted outside Chalfont & Latimer Station - London Underground Zone 8 - you will be escorted from the station by your hosts to a secret woodland estate. From here, you will embark on a unique and mysterious culinary experience surrounded by stunning deciduous forestry, wildlife, flora and fauna. 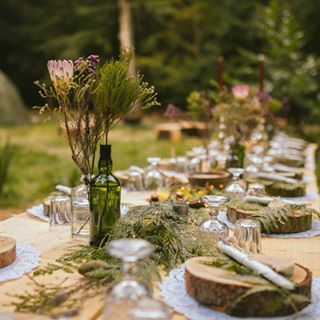 Once you're in the forest you will meet our acclaimed mystery chef from the evening with whom you will pick out local seasonal ingredients from the estate. These will be crafted into a four course culinary masterpiece served outdoors and smoked on an open flame using pine, beech and oak wood from the surroundings. The hidden identity of the chefs who are rotated on each experience and the secrecy of the menu are a fundamental part of this mysterious dining experience. Our next chef has worked in some of the UKs top restaurants including two Michelin starred La Pied a Terre. This event is suitable for meat eaters and vegetarians - please get in touch with any other dietary requirements and we'll absolutely do our best to accomodate. Wine and soft drinks are included but please feel free to bring your own also. Nomadic experiences are about creating indelible memories by providing unique immersions in amazing natural settings. Our vision is to create connections using food and nature as a canvas for our guests to interact and explore. We rotate our chefs and our menu ensuring no two dining experiences are the same. Each chef imbues their own culinary style into the dishes they create using fresh seasonal produce sourced from the estate and surrounding areas.